Rt. Hon. Tom Brake MP, Liberal Democrat spokesman for Home Affairs issues, took a Human Rights angle on the recent riots in the United Kingdom. 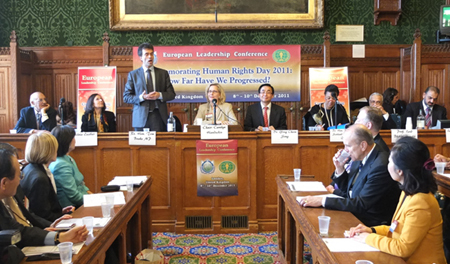 He expressed his concern that Human Rights are experiencing a backlash in UK at the moment. They had not restricted the police in dealing with the looting. “The police does not want or need new weapons, curfew powers, or the power to shut down social networks”, he stated and expressed his concern about misleading language in the media, when it comes to “so-called Human Rights.” He began by thanking Ms. Silvia Escobar for highlighting the issue of the Roma community. This is a real issue for the UK. It goes into the issue of the Bill of Rights and that social rights should be included within that. The Roma do worse than any other group in the UK in terms of health, education and employment. We are failing to address that in a suitable manner. The UK has a proud tradition stemming from the 1950 when the European Convention on Human Rights and the European Court was set up. There have been some real successes in support of Human Rights. We were there at the outset arguing for real fundamental rights. Now we are stopping local Government from snooping on law-abiding families, stopping rapists from cross examining their victims, protecting the anonymity of journalists sources, taking innocent people off the DNA database etc. There is a backlash against Human Rights in the Conservative party. Tom Brake feels that this is in spite of these great protections for UK citizens. Some politicians are uncomfortable that Human Rights apply to foreigners. 'Prisoners right to vote' is a controversial decision that emerged from the European Court of Human Rights. When we encourage other nations, such as the Ukraine or Russia, to maintain Human Rights, it is important that we keep them ourselves. In relation to riots, the Prime Minister implied that the rioters were influenced by the freedoms provided by the Human Rights Act to participate in the riots. It has become clear since then that it was not the case that rioters were influenced Human Rights protections. Similarly Senior Police Officers said it was not fears of infringing on the Human Rights of the rioters that the Police held back during the beginning of the riots. They just did not have sufficient numbers of Police available to deal with the rioters. Rt. Hon. 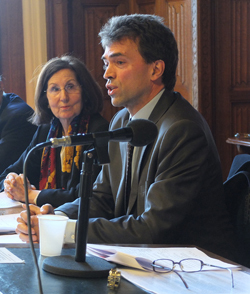 Tom Brake MP: From the age of eight years old, he lived with his family in France and attended the Lycee International in the western suburbs of Paris. As a student in Imperial College he became actively involved in human rights issues. He joined Amnesty International and was chairman of the Imperial College students' group from 1981 to 1982. He was elected to Parliament in 1997. In October 2003 he was promoted and appointed to the Liberal Democrats' Shadow Cabinet, serving as the party's International Development Spokesman. He was a Shadow Minister in the Communities and Local Government Team. He is currently the Liberal Democrat spokesman for Home Affairs issues. He was recently appointed to the Privy Council. He is the Chairman of the National Council for Civil Protection, and a member of the Franco-British Parliamentary Relations Group.